Ruth I. Geary Effa, retired Medical-Surgical Nurse, has been recognized by Marquis Who’s Who Top Nurses for dedication, achievements, and leadership in nursing. A pastor’s wife who has been recognized nationally for the tremendous work she has done as a nurse over the course of 45 years, Mrs. Effa remains a highly regarded professional in the medical community. 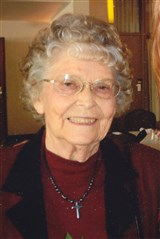 She concluded her career in 1998 as a medical-surgical nurse in Columbus Manor, NE; however, she has continued to contribute to her field as a hospice volunteer for the Columbus Community Hospital. In her career, Mrs. Effa has been most proud of having the opportunity to help others. Notably, she served as a night charge nurse for Beverly Enterprises, charge nurse for Rush County Memorial Hospital, staff nurse for the Community Hospital in Sidney, MT, staff nurse for Drumheller Health Centre and college nurse for the University of Sioux Falls. while working as a college nurse, Mrs. Effa also worked at the local hospital two nights a week during the days of polio. She often went weeks at a time without a night off because there weren’t enough nurses on staff to relieve her. As compassionate as she is hardworking, she refused to leave her patients without care. Mrs. Effa’s career has been supported by a registered nurse distinction and her involvement with the American Nurses Association. In addition, she holds a diploma from the University of Nebraska and completed coursework from the University of Sioux Falls and Hesston College. In recognition of her professional excellence, she was the recipient of a Who’s Who Lifetime Achievement Award. Today, Mrs. Effa enjoys her well-deserved retirement, which includes spending time with her grandchildren Rachel, Jessica and Randall Jr., as well as her great-granddaughter Karen. As she looks to the future, she plans to continue in her volunteer work.